On Saturday, 18 February 1899, Sydney’s Evening News published ‘A Chinese New Year’s Day’, an illustrated article that gave a (white male) journalist’s impressions of the new year celebrations held by Sydney’s Chinese community a week earlier. The new year ushered in that February was, like 2019, a Year of the Pig. The article, transcribed below, is typical of how the mainstream Australian press wrote about Chinese in Australia at the turn of the 20th century, particularly the ‘Chinatown exposé’-type articles found in the popular press. Both the language used and perspective presented in the article firmly ‘other’ Chinese people and Chinese culture, but the article can also be read as a source of information about Chinese cultural practices in Australia on the eve of Federation. So then, how did Sydney’s Chinese community celebrate new year 120 years ago? 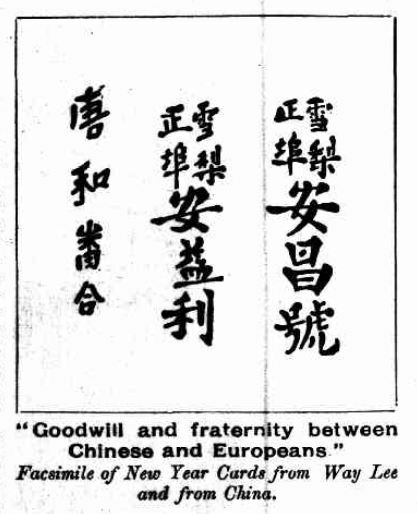 ‘A Chinese New Year’s Day’, Evening News (Sydney), 18 February 1899. BANG! Fizz!! Bang!!! A firework display, or what? The Post Office clock had just chimed 12 at midnight, when these sounds greeted my ears as I was making my way home on the night, or, I should say, early morning, of last Friday, February 10, 1899. Coming round the corner of a street I had to cross on my homeward journey, I was assaulted by a combination of shrieks of delight and explosions that woke the echoes of the street and scared the inevitable cat from off the roofs of the neighbouring houses and sheds. Half-blinded by the sparks that flew up, and smothered by the sulphurous smoke, I found myself in close proximity to about twenty or thirty dancing capering demons, as I took them to be, busily engaged in letting off various abominable samples of the common or garden firecracker of my early youth. As I stood wondering at these things being allowed in the quiet streets of Sydney at this late, or, rather, early house of the morning—Phizz! bang! pop! pop! pop! numerous; it seemed to me hundreds of pops. The clatter, banging, and smashing of tin pans, blowing of horns, scraping of some awful musical instruments—only seen or heard in Eastern countries—portended that a ceremony of great importance must now be going on. I stopped and gazed spellbound on the scene. Just then my eye rested on a tall, dark figure leaning up against a lamp-post. A policeman, thank goodness! I’ll now find out what’s the matter, thought I; and approaching him, I said, “Funny racket this, eh?” He looked at me with an eye of suspicion, as though he was contemplating a “run in,” which could be sworn to in the morning as being an assault on the police and damaging, etc., fine 10s, and costs, with 21s for uniform; but on the magic word “press” he explained to me that it was simply the opening of the Chinese new year. The new year was, I subsequently found, the year 5650, and is known as “Kee Hoy” [己亥], or the dynasty of “Ching” [清], whose family has reigned over China for the past 400 years. The name of the present Emperor is Quong Soy [光緒] (no relation to the inventor of the celebrated sauce of that name). “Why,” said I to the policeman, “they make a fuss of our way of celebrating ‘our New Year’ with noise, shouting, and performances on the trumpets, but what about this?” “Oh, they’re all right, and harmless enough; and to-morrow they’ll keep it up in great style, you take my word for it. If you’ve got nothing else to do you take a trip over to the Glebe to their josshouse about 8 in the morning, and you’ll see some fun; and then do a tour round the Chinese quarters. Talk about a time? Why our New Year’s Day is nothing to theirs.” “Thanks, I will,” and with a parting “good night” to the officer of the law, and a parting grand double-barrelled salute on the part of the happy Celestials, who just then let off about—well goodness only knows how many bungers, crackers, and other Celestial fireworks—I wended my was home, resolving in my mind, as I fell asleep, to spend a day among the Chinese residents of the city of Sydney on their great day of the year, namely, “New Year’s Day”, and as I fell asleep, I seemed to be wafted away on the wings of dim and dusky Chinese angels, amidst corruscations of golden light, sparks of fire, and amidst a general concatenation of hideous sounds and awfulness. The Chinese residents of Sydney, or I may say of Australasia in general, celebrate their New Year by making a general holiday of at least three days, during which no work is done, and the time is given up to calling on each other, and wishing a happy New Year, or in their own vernacular, “Goon Hee Fad Choy [恭喜發財].” The Chinese New Year’s card is a quaint one, and consists of a slip of particularly brilliant red paper 9½in long by 4½in in width, on which are written the names of the sender, wishing the recipient a heartfelt greeting for a prosperous New Year. On entering the house of a friend they advance with the slip of paper folded in a certain way held in both hands, and after expressing themselves in the words quoted above the slip is deposited in a china plate placed for the purpose on a table in the centre of the room, around which are other tables covered with gorgeous tablecloths and numerous china dishes and bowls, containing dried melon-seeds, ginger, biscuits, dried fruit, and other simple dainties. They do not forget liquids either, as the very finest brands of champagne, brandies, whiskies, and gins, with first-class brands of cigars and cigarettes are to be seen; and the hospitable host presses one and all who visit him to partake of the good things provided, and as you leave hands you a cigar, with expressions of pleasure at your doing him the honor of calling. There he is arrayed in the very finest of his gorgeous Eastern silks, bespangles with gold, and lovely silk embroidery, his hair twisted up in snake-like folds almost hidden by a black silk cap, diamonds glisten on his tapering fingers, and his smiling face and twinkling black eyes meet yours with expressions of mirth and goodwill towards you and yours in the coming new year. The Chinese ladies of the family are never seen; but they children, if any, are resplendent in their finery, and pleased to meet and accept any presents which may be brought. The Chinese at this time of the year make a point of settling up all their outstanding accounts, and the day before their New Year’s Day, is generally spent in going round settling up their indebtedness, both among their own people and their European friends, as they do not deem it lucky to enter into a new year owning anyone money. 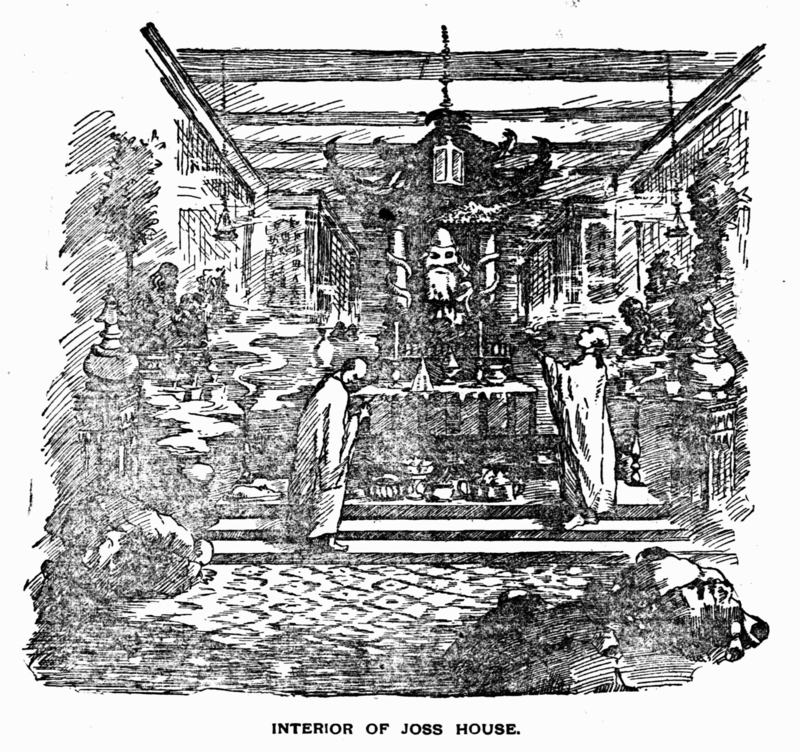 ‘Interior of joss house’, Evening News (Sydney), 18 February 1899. A Chinese josshouse is a place which well re-pays a visit. There will be found Chinese of all descriptions, from the rich merchant to the humble gardener, arrayed in their best clothes, with presents of fowls, sucking pigs, fruit, flowers, and other delicacies dear to their Eastern tastes. The priest, arrayed in garments vying with the peacock for splendor, with curious shaved head and solemn mien, bowing and gesticulating before the altar, one which sits perched up on crimson and golden starred cloth, strange carved wooden gods, hideous in their dark mahogany carvings, or grotesque China images, representing the golds of air, light, water, and the various gods of the household. Paper flowers in profusion, long gilt bamboo sticks, tipped with some strange preparation, are stuck into pots of earth, slowly burning, and filling the dimly lighted chamber with a fragrant incense that rises in soft mauve velvet colored clouds to the richly decorated roof. Here, after a service of curious ceremonies, and presenting of presents of money and other things, they disperse, chattering and wishing each other compliments, etc., to their homes, where friends both European and Chinese will call during the ensuing days. 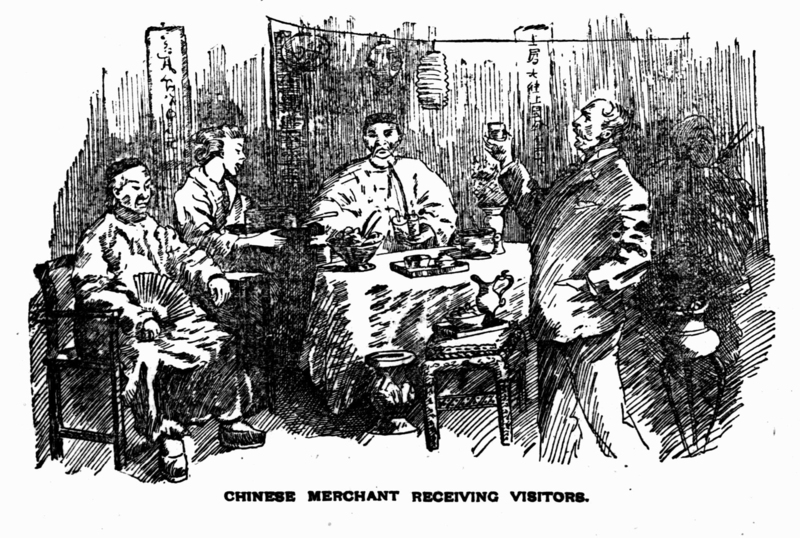 ‘Chinese merchant receiving visitors’, Evening News (Sydney), 18 February 1899. Amongst the more ordinary Chinese, such as cabinetmakers, fruiterers, gardeners, and hawkers, the first day of their New Year is held as a holiday, and they are very pleased indeed to see any and all of their own countrymen, and also any white man whom they have met in the ordinary course of business during the past year. Their reception of you is just as cordial as in the richer quarters. Spread out in little China plates are the inevitable dried melon seeds, little bits of preserved ginger, small cakes, and tea, real Chinese tea, which is served up in delicate, fragile little china cups, no milk, but sugar if you wish; also they offer you a kind of spirit, white and very strong, made, I believe, from rice, or some other grain; it is by no means unpalatable, but is very potent, and anyone taking several of these nips would regret it next morning. You will notice in many cases that the Chinese wear a bangle of peculiar greyish, green-looking stone on their wrists. This may be of real jade, a valuable commodity, but in many instances it is only imitation, and procured for a shilling or two. These bracelets are supposed to bear a certain charm for the well-being of the wearer, and the idiotic superstition regarding the lovely, but very often despised opal, does not seem to have much weight with them, as you will find that gem very much in vogue as rings, breastpins, and studs, either plain or set round with diamonds. The Chinese are great admirers or good genuine jewellery, and on the occasion of the New Year, don as much as they may own. I saw one rich merchant with diamond of great value in his shirt front, and rings on every finger, set with the same magnificent stones. As he manipulated his cigarette, rolling it between his long slender fingers, a perfect blaze of light played round his hands. I heard from another Chinese that he had over £900 worth on him. Gold chains and very richly embroidered slippers complete their attire on these festive occasions. Although the greater part of the holiday is spent in calling from one house to the other, and partaking of various beverages, not by any means temperance, you will not find any unseemly conduct on the part of the Chinese, or at any hour of the day or night come across a drunken one. They must have different constitutions from Europeans, as I have met several who had been spending their day amongst the genial Cathaians, not wisely but undoubtedly too well. Taking altogether the curious ceremonies, festivities, and peculiarities of the Chinese, the chance of spending a few hours amongst them on this, the greatest day of their year, is one that you will remember, and talk about for many days to follow. 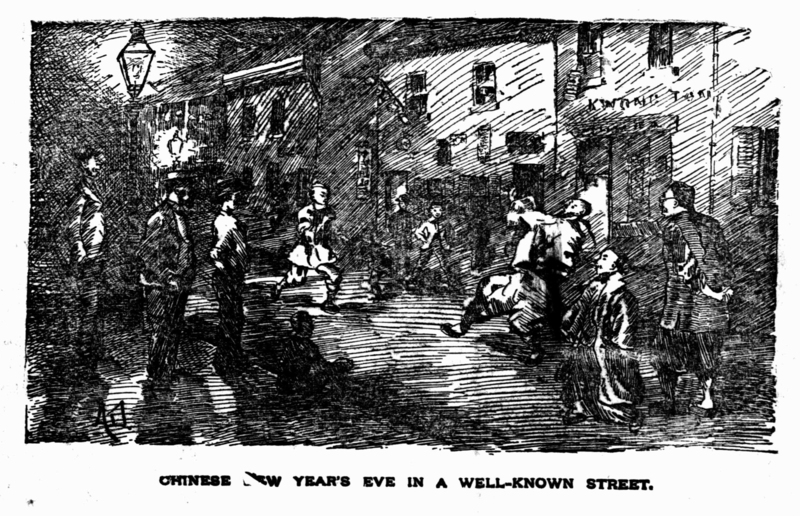 ‘Chinese New Year’s Eve in a well-known street’, Evening News (Sydney), 18 February 1899. The ‘well-known street’ is probably Wexford Street, Surry Hills. During the evening, bands of celebrated musicians, amongst the Chinese, are engaged to enliven the houses of the rich merchants, and anyone passing by during the evening will be struck with the peculiar twanging of their strange instruments, the tum-tum of drums, , the clashing of symbols, and the staccato voices of the Celestials rise out upon the still, moonlit night, filling one with thoughts of far-away Eastern cities, and dreams of strange customs in far Cathay. 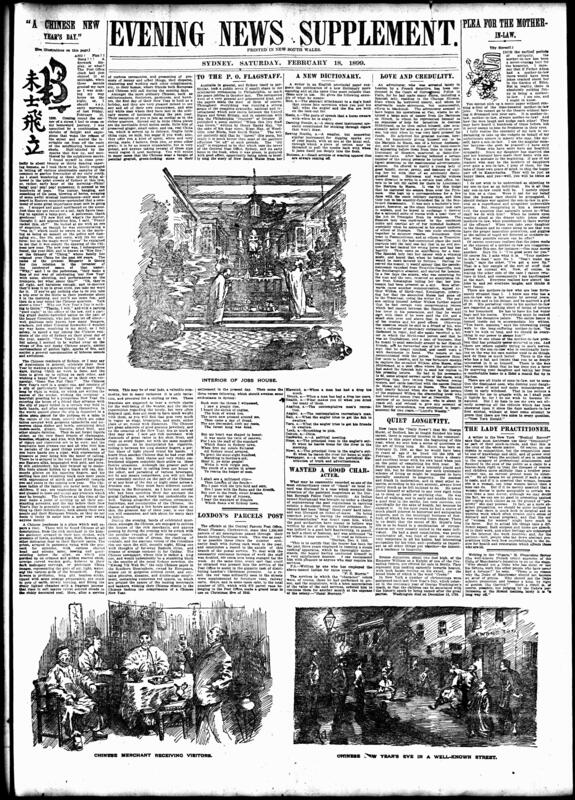 The Chinese newspapers, whose title is rather a long one, and would undoubtedly be a stumbling block in the mouths of the usual Sydney newsboy, the “Kwong Yik Wah Bo” [廣益華報], the only Chinese paper in the Southern Hemisphere, owned by Europeans, comes out in gorgeous colored cover, and contains pictures, almanac, and double-page supplement, containing numerous red spaces, on which are printed the names of the leading merchants and bankers, wishing their Chinese clients in the Chinese fashion the complements of a Chinese New Year. Wishing everyone a happy Year of the Pig 2019! 恭喜發財! This year I’ll be heading to New Zealand, to the archives in Wellington and Dunedin, to research the history of Chinese naturalisation there. With that in mind, here’s a report from 1884 on Chinese New Year celebrations on the Otago goldfields. Happy New Year, or ‘kung he fat soy’ to you all! 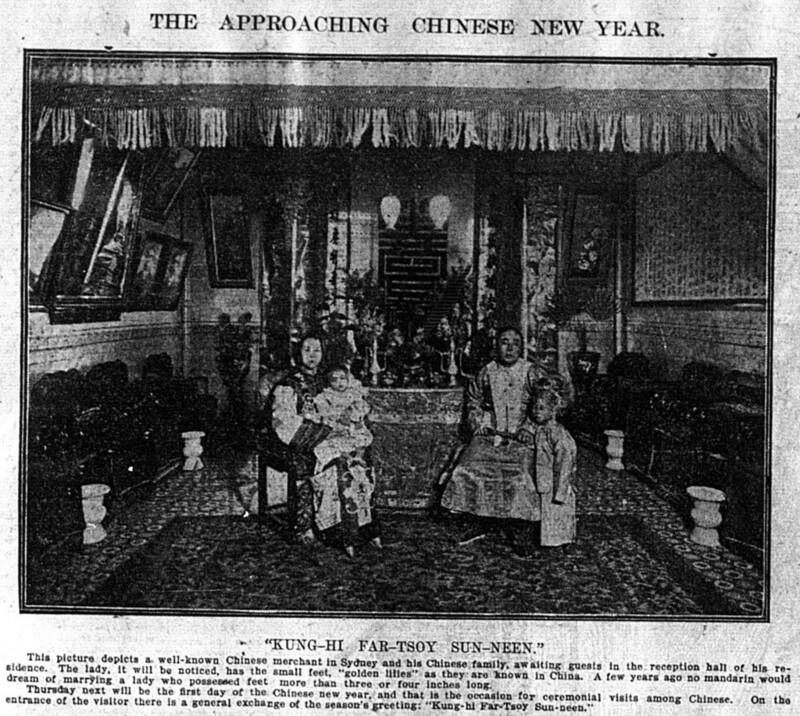 On 5 February 1910, Sydney’s Daily Telegraph newspaper published this series of photographs of Sydney’s Chinese community to mark the upcoming Chinese New Year. 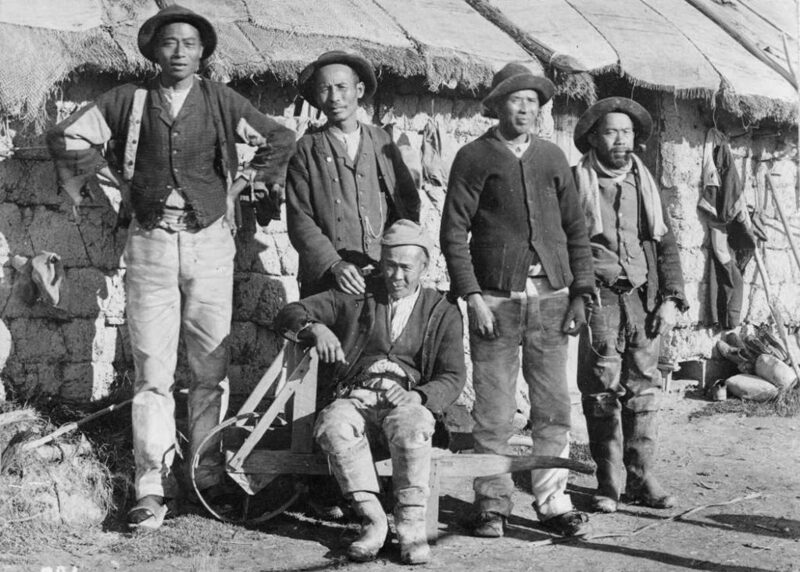 One hundred and six years later I’d like to say, ‘kung-hi far-tsoy’ everyone! This picture depicts a well-known Chinese merchant in Sydney and his Chinese family, awaiting guests in the reception hall of his residence. The lady, it will be noticed, has the small feet, ‘golden lillies’ as they are known in China. A few years ago no mandarin would dream of marrying a lady who possessed feet more than three or four inches long. The Chinese shops in Sydney are mostly of the general store type. 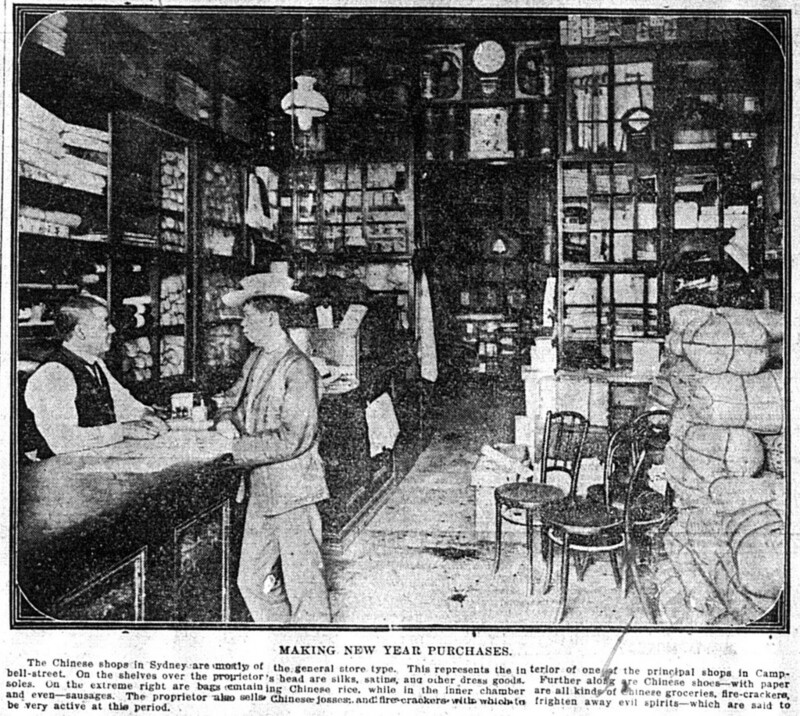 This represents the interior of one of the principal shops in Campbell-street. On the shelves over the proprietor’s head are silks, satins, and other dress goods. Further along are Chinese shoes–with paper soles. On the extreme right are bags containing Chinese rice, while in the inner chamber are all kinds of Chinese groceries, fire-crackers, and even–sausages. The proprietor also sells Chinese josses and fire-crackers with which to frighten away evil spirits–which are said to be very active at this period. 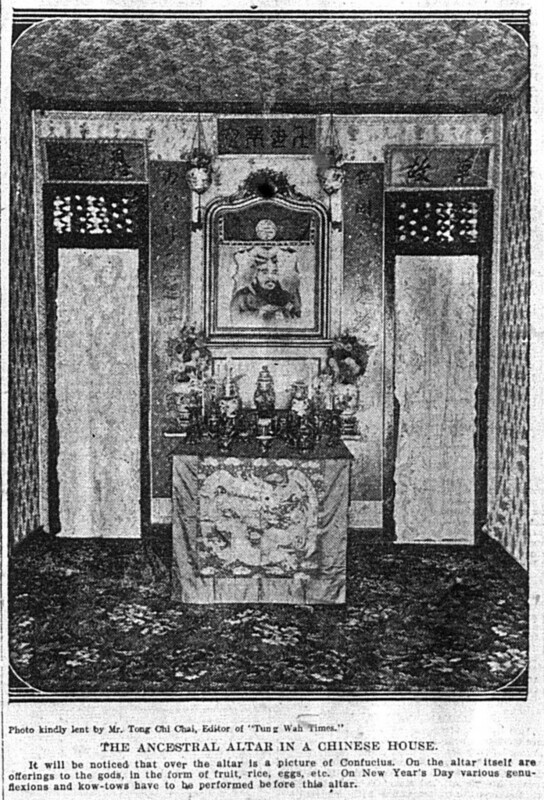 THE ANCESTRAL ALTAR IN A CHINESE HOUSE. It will be noticed that over the altar is a picture of Confucius. On the altar itself are offerings to the gods, in the form of fruit, rice, eggs, etc. On New Year’s Day various genuflexions and kow-tows have to be performed before this altar. POULTRY FOR THE NEW YEAR. 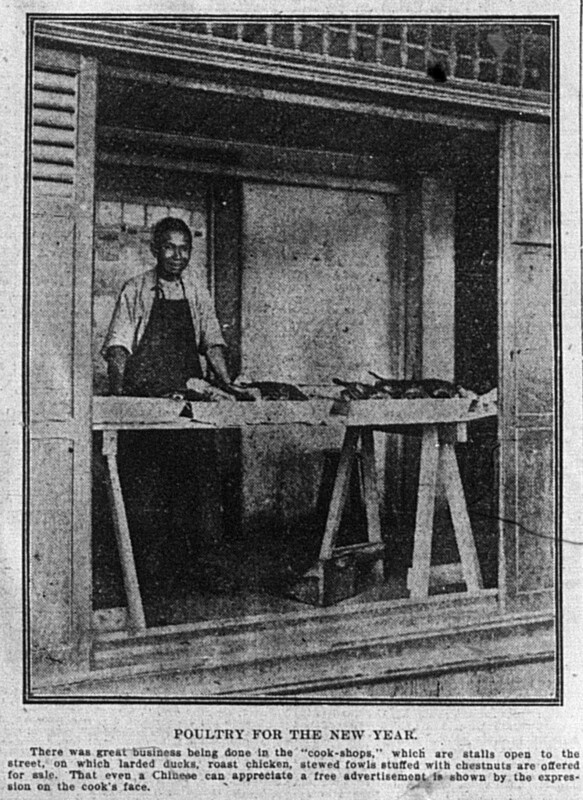 There was great business being done in the ‘cook-shops,’ which are stalls open to the street, on which larded ducks, roast chicken, stewed fowls stuffed with chestnuts are offered for sale. That even a Chinese can appreciate a free advertisement is shown by the expression on the cook’s face. The coming in of the Chinese new year was duly celebrated on Wednesday week by the Chinese shopkeepers of Sydney with ceremonies peculiar to themselves, winding up with an ample supper (SMH, 8 February 1862). The Chinese New Year.—On Wednesday last, says the Sydney Herald, all the Chinese shopkeepers in Sydney closed their establishments, and refused to serve customers. Upon inquiry, it was discovered that, according to the Chinese reckoning, the old year closed with Wednesday, and that the event was being celebrated in the usual Chinese fashion. In the evening a pig was killed and its head having been dressed, it was adorned with flowers and placed in a conspicuous place in one of the Chinese houses, where each Chinaman in turn bowed down before it, apparently performing some act of religious homage. The floor of each of the apartments in the house was extensively lighted with candles in bottles, and after the religious ceremonial was over, the company adjourned to partake of a sumptuous supper, consisting of an abundance of poultry. The body of the pig was also served up and eaten. Musical performances in the Chinese style followed, and were kept up till daylight in the new year (Queanbeyan Age and General Advertiser, 13 February 1862). Kung hei faat choi! Xin nian kuai le! 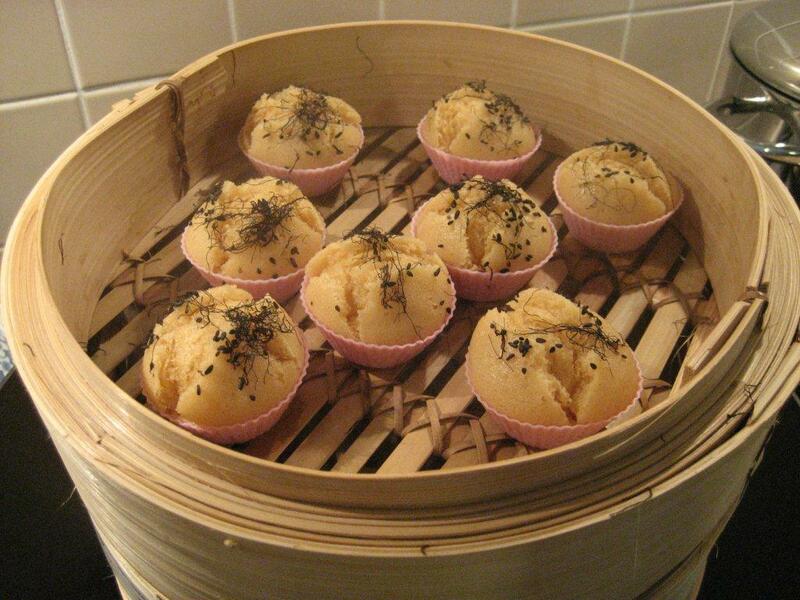 To celebrate Chinese New Year, here’s a recipe for new year cakes known in Taishanese as ‘faat tay’ . ‘Faat’ is the same word as in the traditional new year greeting ‘gung hei faat choi’. ‘Tay’ is the Taishanese word for cake. If you make these and then tell your average Australian what they are called, expect unfriendly jokes about how they are, in fact, ‘farty’ cakes. Or maybe that was just my cultured colleagues at the archives. And my five-year-old. The recipe is simple (and vegan – no eggs, butter or milk) and they’re quick to make. As well as the name, expect comments about the topping – instead of icing, faat tay have black sesame seeds and faat choi (black moss or hair moss) on top. 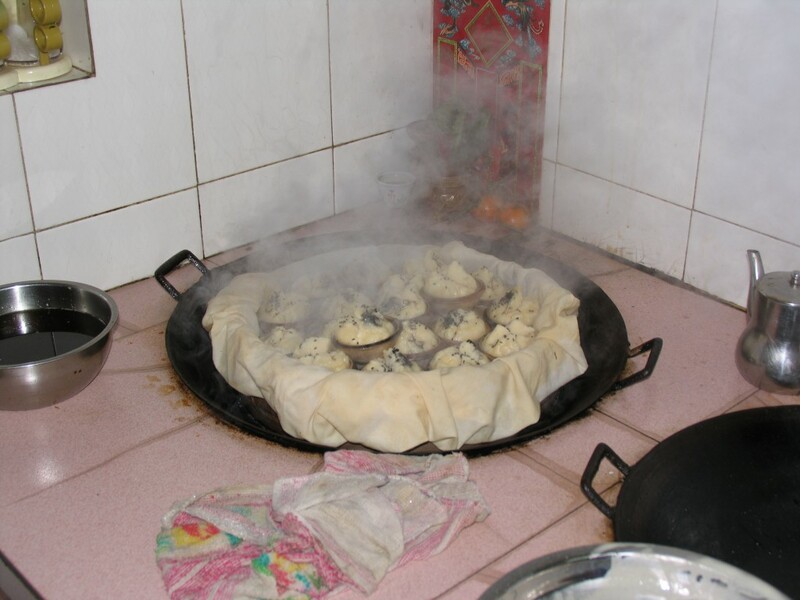 Made the proper way – the way it’s done in the village – the cakes are steamed in a wok over a wood-fired stove (see the picture below). Since I don’t have an old-style Chinese stove at home, or an enormous wok, or the lovely little pottery dishes that the cakes are steamed in, I’ve had to improvise. I’ve also had to improvise with the recipe too. I’ve seen recipes for similar new year cakes in recipe books, but they included ingredients like yeast and eggs, which this recipe doesn’t. You should be able to get the faat choi and black sesame seeds (haak jee ma) at your local Chinese grocer. You only need a tiny bit of faat choy for each cake, but you might just have to buy an enormous bag of it. 1. Dissolve the peen tong in the water. Either heat them together on the stove or boil the water and leave the peen tong in it until dissolved. Set aside to cool. It’s best if you can break the peen tong up first – try whacking it with the handle of a heavy knife or chopper. The sugar can take a while to dissolve, so it’s best to do this step well before you plan to actually make the cakes. 2. Sift flour and baking powder into a bowl. 3. Stir sugar water and oil into flour mixture. 4. Mix well, and beat to get out the lumps if necessary. 5. Bring some water to boil in a large wok. 6. While the water is coming to the boil, put batter into patty pans. Depending on the type of patty pans/teacups you use, you might want to grease them with some oil to stop the cakes sticking. Put patty pans into bamboo steamer in the wok and cover. 7. Steam over a high heat, with water at a rapid boil. 8. When the cakes are about half done but still sticky on top (after about 2–3 minutes), sprinkle a small amount of faat choi and black sesame seeds on top. 9. The cakes are cooked when a skewer comes out clean, and the tops have ‘popped’ (they should crack). It will take between 5 to 10 minutes. The cakes will not be brown because they are steamed. 10. Remove the steamer from the wok and let cakes cool.